Designed to your special heating requirements, the Sussman Series SSH steam superheaters are suitable for the heating of saturated steam under pressurized conditions adding BTU s to increase the quality and raise the temperature of saturated steam to match your process requirements. The SSH series provides a safe, reliable energy- efficient method for a multitude of industrial applications where house steam or dedicated-boiler steam is available. ASME Code pressure vessel. National Board registered. Standard ratings up to 1000° F/750 PSIG. Incoloy 800 high grade Stainless Steel elements. Flanged or NPT inlet/outlet connections. Just set in place, connect power source and complete inlet/outlet piping. Pre-mounted, wired and tested control panel. Fully insulated vessel with outer metal enclosure. Carbon steel construction up to 750° F discharge temperature. Built-in 120V control circuit transformer. Electronic digital PID temperature controller and electronic high limit temperature protection. Pressure vessel ASME Code Stamped and National Board registered. Built to NEC electrical wiring requirements. NEMA 4, 12 Area classification. 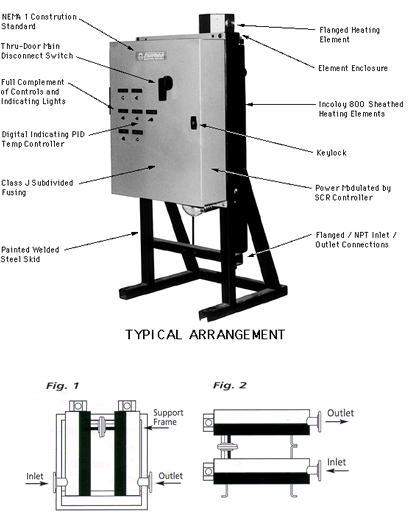 Superheater and control panel for separate mounting. Addition of inlet flow switch. Pressures up to 300 PSIG and Temperatures up to 1000°F. Voltmeters, ammeters surface mounted on control panel. Design and construction available for air, water, oil and gaseous heating requirements.